Human figure dressed in Army overcoat, head covered with winter hat with ear flaps. Right leg and left arm missing (war wounds). Figure is leaning on a crutch and against a pole bearing sign ""Bus Stop"". 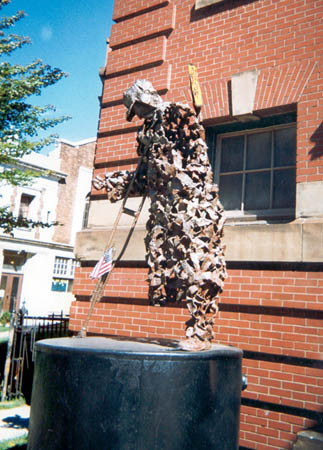 : “Vietnam Veteran,” Ohio Outdoor Sculpture Inventory, accessed April 20, 2019, http://oosi.sculpturecenter.org/items/show/1030.